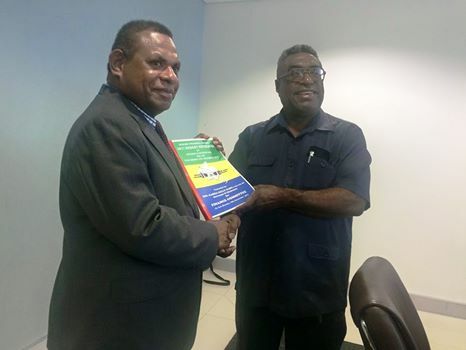 Governor for Lae, Morobe province Mr. Kelly Naru has presented the 2017 Morobe provincial government budget to the Minister for Treasury and Member for Aitape-Lumi Mr Patrick Pruaitch this morning in Port Moresby. Mr Naru says the budget underwent serious consultations with senior member from the administrations and a selected team from the provincial executive council headed by the Deputy Governor before presenting the budget to the Minister for Treasury. He says the budget was approved by the budget committee and as a chairman for the budget committee; he presented the budget to the Tutumang Assembly during their last session in 19th December 2016. He says Tutumang Assembly approved the budget of K424, 413, 300.00. Governor Naru was assisted by the Provincial Administrator Ms.Shilla Harou and member for Huon Gulf Ross Seymour, Minister for Treasury Mr. Pruaitch upon receiving the provincial budget acknowledge the budget and thank the governor and his team for the presentations and to be the second province to present the budget this year. The first province to present their budget was Milne Bay. He says the budget has gone through the normal consultation process to be approved by the Tutumang Assembly. Minister Pruaitch says the ministry will go through the budget to ensure the budget adhere to the framework the ministry has set out for all government agencies.